Listen to the podcast. Find it on iTunes/iPod and Podcast.com. View a full transcript or download the transcript. Sponsor: Hewlett-Packard. 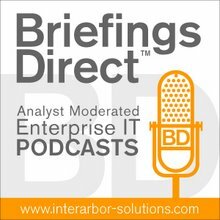 Welcome to a podcast discussion on how to make the most of cloud computing for innovative solving of industry-level problems. As enterprises seek to exploit cloud computing, business leaders are focused on new productivity benefits. Yet, the IT folks need to focus on the technology in order to propel those business solutions forward. As enterprises confront cloud computing, they want to know what's going to enable new and potentially revolutionary business outcomes. How will business process innovation -- necessitated by the reset economy -- gain from using cloud-based services, models, and solutions? Early examples of applying cloud to industry challenges, such as the recent GS1 Canada Food Recall Initiative, show that doing things in new ways can have huge payoffs. We'll learn about the HP Cloud Product Recall Platform that provides the underlying infrastructure for the GS1 Canada food recall solution, and we will dig deeper into what cloud computing means for companies in the manufacturing and distribution industries and the "new era" of Moore's Law. Here to help explain the benefits of cloud computing and vertical business transformation, we're joined by Mick Keyes, senior architect in the HP Chief Technology Office; Rebecca Lawson, director of Worldwide Cloud Marketing at HP, and Chris Coughlan, director of HP's Track and Trace Cloud Competency Center. The dicussion is koderated by me, Dana Gardner, principal analyst at Interarbor Solutions. Lawson: Everyone knows that "cloud" is a word that tends to get hugely overused. We try to think a bout what kinds of problems our customers are trying to solve, and what are some new technologies that are here now, or that are coming down the pike, to help them solve problems that currently can't be solved with traditional business processing approaches. Rather than the cloud being about just reducing costs, by moving workloads to somebody else's virtual machine, we take a customer point of view -- in this case, manufacturing -- to say, "What are the problems that manufacturers have that can't be solved by traditional supply chain or business processing the way that we know it today, with all the implicated integrations and such?" As we move forward, we see that, different vertical markets -- for example, manufacturing or pharmaceuticals -- will start to have ecosystems evolve around them. These ecosystems will be a place or a dynamic that has technology-enabled services, cloud services that are accessible and sharable and help the collaboration and sharing across different constituents in that vertical market. We think that, just as social networks have helped us all connect on a personal level with friends from the past and such, vertical ecosystems will serve business interests across large bodies of companies, organizations, or constituents, so that they can start to share, collaborate, and solve different kinds of issues that are germane to that industry. A great example of that is what we're doing with the manufacturing industry around our collaboration with GS1, where we are solving problems related to traceability and recall. Keyes: If you look at supply chains, food is a good example. It's one of the more complicated ones, a ctually. You can have anywhere up to 15-20 different entities involved in a supply chain. In reality, you've got a farmer out there growing some food. When he harvests that food, he's got to move it to different manufacturers, processors, wholesalers, transportation, and to retail, before it finally gets to the actual consumer itself. There is a lot of data being gathered at each stage of that supply chain. Coughlan: As a consumer, it gives you a lot more confidence that the health and safety issues are being dealt with, because, in some cases, this is a life and death situation. The sooner you solve the problem, the sooner everybody knows about it. You have a better opportunity of potentially saving lives. So we really look at it from a positive view also, about how this is creating benefits from a business point of view. As well as that, you're looking at brand protection and you're also looking at removing from the supply chain things that could have further knock-on effects as well. Keyes: In the traditional way we looked at how that supply chain has traceability, they would have the, infamous -- I would call it -- "one step up, one step down" exchange of data, which meant really that each entity in the supply chain exchanged information with the next one in line. That's fine, but it's costly. Also, it doesn't allow for good visibility into the total supply chain, which is what the end goal actually is. What we are saying to industry at the moment -- and this is our thesis here that we are actually developing -- is that, HP, with a cloud platform, will provide the hub, where people can either send data or allow us to access data. What a cloud will do is aggregate different piece of information to provide value to all elements of the supply chain to give greater visibility into the supply itself. ... We have SaaS now, not just to any individual entity in the supply chain, but anybody who subscribes to our hub. We can aggregate all the information, and we're able to give them back very valuable information on how their product is used further up the supply chain. So we really look at it from a positive view also, about how this is creating benefits from a business point of view. So, depending on what type of industry you're in, we're looking at this platform as being almost a repeatable type of offering, and you can start to lay out individual or specific industry services around this. We're also looking at how you integrate this into the whole social-networking arena, because that's information and data out there. People are looking to consume information, or get involved in information sharing to a certain degree. We see that as a cool component also that we can perhaps do some BI around and be able to offer information to industry, consumers, and the regulatory bodies fairly quickly. Coughlan: The point there is that cloud is enabling a convergence between enterprises. It's enabling enterprise collaboration, first of all, and then it's going one step further, where it's enabling the convergence of that enterprise collaboration with Web 2.0. You can overlay a whole pile of things --carbon footprints, dietary information, and ethical food. Not only is it going to be in the food area, as we said. It's going to be along every manufacturing supply chain -- pharmaceuticals, the motor industry, or whatever. Lawson: The key to this is that this technology is not causing the manufacturers to do a lot of work. ... It's not a lot of effort on my part to participate in the benefits of being in that traceability and recall ecosystem, because I and all the other people along that supply chain are all contributing the relevant data that we already have. That's going to serve a greater whole, and we can all tap into that data as well.